Over the years, I, like many gardeners, have purchased shrubs that appealed to me but that I did not know very much about. This behavior on my part eventually led to my planting three quince Chaenomeles japonica shrubs in various parts of my garden. I have always enjoyed these additions because of their lovely, delicate, cup-shaped spring flowers which offer delightful fragrance. Since I love these shrubs, I shared a cutting with my friend Melinda in Massapequa. Her shrub has now been in her garden for two years. When she spoke with me recently, she excitedly shared that her shrub has small greenish fruit on it. Her shrubs had finally produced the quince fruit I had spoken about. It seems that it takes two or three years before the shrubs produce fruit. The shrubs were in my garden for a few years before they surprised me one year by developing striking, yellow-green, apple-shaped fruits. They were edible, but rock hard and slightly bitter. I later learned that they needed to be cooked to make them palatable. 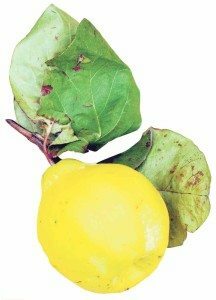 Through my research, I discovered that there is another genus of quince which is a deciduous tree with larger, more dense and better tasting, pear-shaped fruit. This tree form is Cydonia oblonga, which is native to Turkey and Southeast Asia. These trees are less hardy than the shrubs since they must be protected in areas where temperatures drop below 5 degrees. They will survive here on Long Island, but should be protected by a wall or fence. 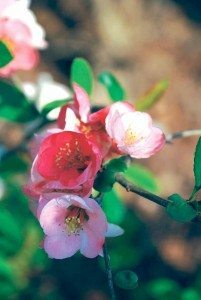 Chaenomeles shrubs, which are native to Japan and Asia, are hardier here and produce smaller and less flavorful fruit than Cydonia. 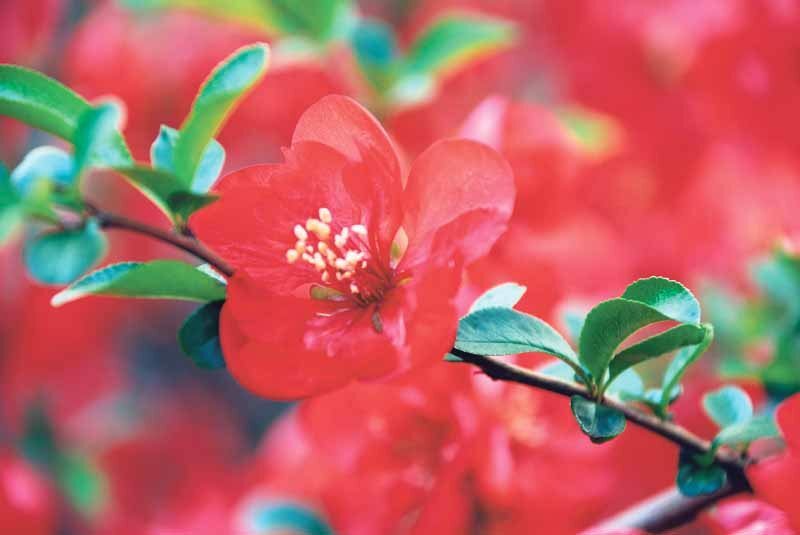 Cydonia trees are self fertile, however, Chaenomeles need two varieties to pollinate which means that if you don’t have two shrubs, some neighbor must have one in order for the pollinators to do their jobs. Able to tolerate partial shade, they set and bear fruit best in full sun. Both thrive with rich soil that is moist but well-drained. They should be pruned when dormant in late winter or early spring to encourage new growth since both of these species flower and then set fruit on new wood. 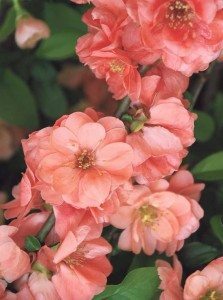 Cydonia can grow to 25 feet but Chaenomeles grow from 3-8 feet, depending on the variety and are often used to create hedges. Should you wish to eat the fruit, know that the color provides the best guide for determining ripeness. A fully ripe quince turns completely yellow at maturity, which is usually in the fall. The fruit also develops a strong sweet fragrance once it’s fully ripe. If you have to tug on the fruit to remove it from the tree or shrub, it isn’t quite ripe. Avoid twisting off the fruit, instead cut the stem in order not to damage the stem end. If you are storing these fruits before cooking them remember that they bruise easily so treat them gently. You can store the fruits in a cool, dark place for up to a month. A note of caution: like many Rosaceae species, the seeds of Cydonia oblonga are poisonous and should be removed and not ingested since they contain hydrogen cyanide. Cydonia varieties to look for: Champion, which has good fragrance and flavor and is reliable even in wet conditions; Smyrna, with large, bright yellow skin; and Pineapple, with pear-shaped fruit. 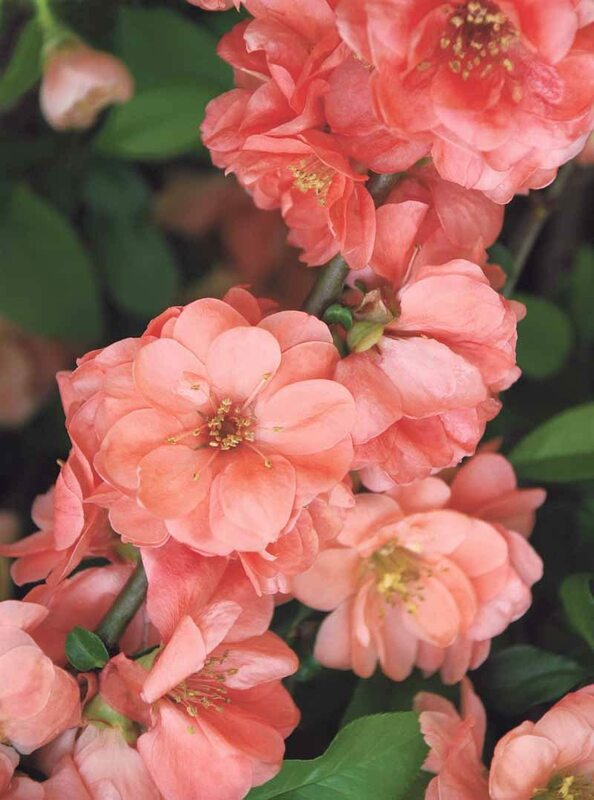 Chaenomeles japonica varieties to look for: Jet Trail, which has white flowers; Cameo, which is thornless, has peach pink flowers and yellow fruit; and Texas Scarlett, which has tomato-red flowers. Quince, the Golden Apple of the ancients, was once looked upon as the emblem of love and happiness. Years ago, quince trees could be found on many rural properties throughout our region. Today they are not often found, but we should consider adding them once again since they are small, beautiful trees that offer us fruit. But whether or not you enjoy their fruit, try planting one for their beautiful, fragrant flowers. Josephine Borut is currently on the board of directors of the Long Island Horticultural Society and is a past board member of the Long Island Rose Society. She is a current member of The American Rose Society, The Herb Society and The Long Island Horticultural Society, which meets on Sunday afternoons, with the conference center doors opening at 1:30 p.m. at Planting Fields Arboretum in Oyster Bay. The next meeting is Oct. 16 with speaker Kathleen Gagan, owner of Peony’s Envy. The topic will be Peony Planting, Care and Propagation. For more information, go to www.lihort.org.